McFa dden Engineering, Inc. was retained to act as the lead consultant for environmental site assessment activities and remediation at the Pinebrook Shopping Center in Mobile, Alabama. The location of the site assessment was formerly home to Lord’s Dry Cleaners, a dry cleaning establishment that leased space at the Pinebrook Shopping Center. McFadden Engineering was tasked with assessing the impacts to soil and groundwater from chemicals of concern (COCs) related to dry cleaning operations. We conducted a preliminary investigation that studied soil and groundwater quality below the foundation of the building. Further investigation was conducted outside the building footprint to determine lateral extents of COCs in groundwater. Based on findings from these assessments, McFadden Engineering proposed a remedial strategy that focused on reducing COC concentrations in groundwater below the building where the former dry cleaners operated. 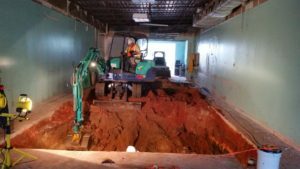 This strategy included the excavation and removal of COC impacted soil from an area inside the former dry cleaners facility. 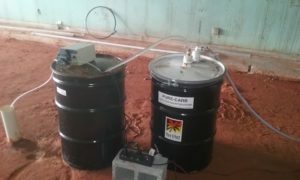 Upon completion of the soil removal activities, an onsite groundwater recovery and treatment system was installed. Groundwater treatment has been accomplished by pumping groundwater from a recovery well inside the facility through a granular activated carbon filter to remove the COCs and subsequently aerating the water to raise the pH to an acceptable level prior to discharge to the sewer system. Since groundwater COCs have been reduced to stable concentrations, a risk-based corrective action approach is being implemented along with appropriate engineering controls and deed restrictions to eliminate exposure pathways for future occupants of the facility.